“Movie posters?” a cynic might scoff. “They’re a dying art form. Nobody even bothers doing illustrations anymore. Nowadays, it’s all that floating-head, generic crap which has been photoshopped to within an inch of its life.” A visit to the lobby of the local cineplex or the DVD department at Target might confirm those pessimistic beliefs. Such a cynic, however, should be introduced with all deliberate speed to the work of Grzegorz “Gabz” Domaradzki. The name? Admittedly difficult to remember. The work? Equally difficult to forget. 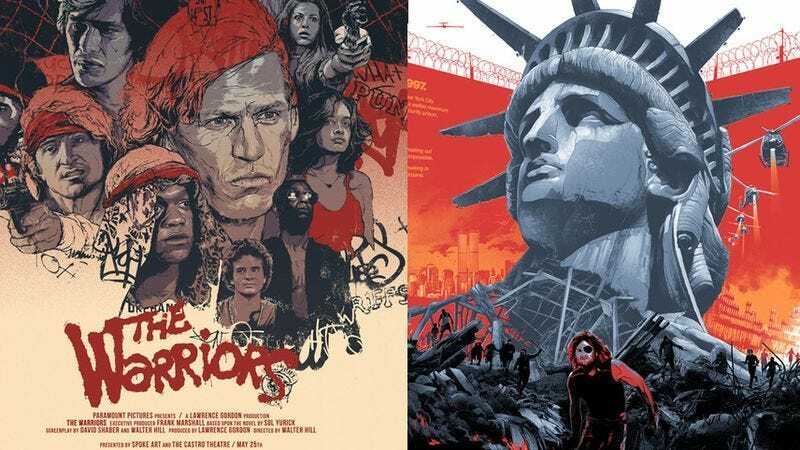 Zach Tutor’s contemporary art blog Supersonic has recently spotlighted this illustrator’s lovingly-rendered, labor-intensive work with a gallery of his movie posters for such violence-heavy titles as Fargo, Predator, The Warriors, and, uh, The Mask Of Zorro. Sure. Why not? In sharp contrast to the anonymous, assembly-line movie posters in common usage today, Domaradzki’s work is personal and distinctive, favoring washed-out color schemes of blue, red, yellow, and grey and pyramidal compositions in which a single dominant figure looms ominously over several other personages against a bleakly beautiful backdrop. Those whose appetites have been whetted by the Supersonic piece are invited to browse more of the artist’s work at his personal website, which contains more posters and some non movie-related pieces as well.